Description: The flowers are glabrous, shaped like inverted vases, 1/4 inch (6 mm) long, and in clusters at the branch tips. 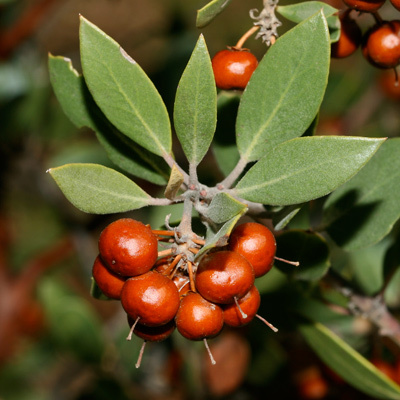 The flowers are followed by round, reddish brown to orange berries. Animals and birds will eat the fruit. 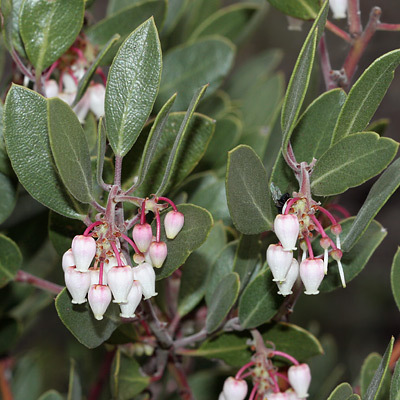 The leaves are green, stiff, leathery, held vertically, and have sharply pointed tips. The branches have beautiful, smooth, reddish brown bark. 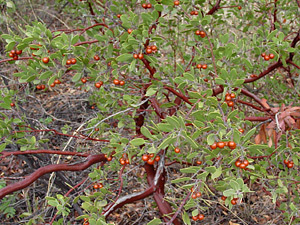 Edible – The fruit is edible either raw or cooked, but it is dry and mealy.